Welcome Home Series<sup></sup> handlesets are the perfect addition to your front door to create a unique and fashionable entryway to your home. Each is stylishly designed to provide maximum-security protection. There are many styles, finishes and configurations from which to choose. The straight styling of the Aspen lever creates an elegant, contemporary feel Both knobs/levers can be locked or unlocked by key on the outside, or turn button on the inside. The Venetian Bronze finish is hand-rubbed to reveal unique bronze highlights and provides a rich and warm complement to the product's style. With this Electronic Camelot Handle Set paired with an Accent lever in Antique Pewter you don't have to worry anymore about hiding keys under the doormat. No more losing, forgetting, or making extras keys time and time again. Step up to a more secure and flexible solution with Schlage electronic security products. Youre free to add, change, or delete user codes in just seconds and to come and go as you please. Aspen Venetian Bronze Entry Lever Welcome Home Series<sup></sup> handlesets are the perfect addition to your front door to create a unique and fashionable entryway to your home. Each is stylishly designed to provide maximum-security protection. There are many styles, finishes and configurations from which to choose. 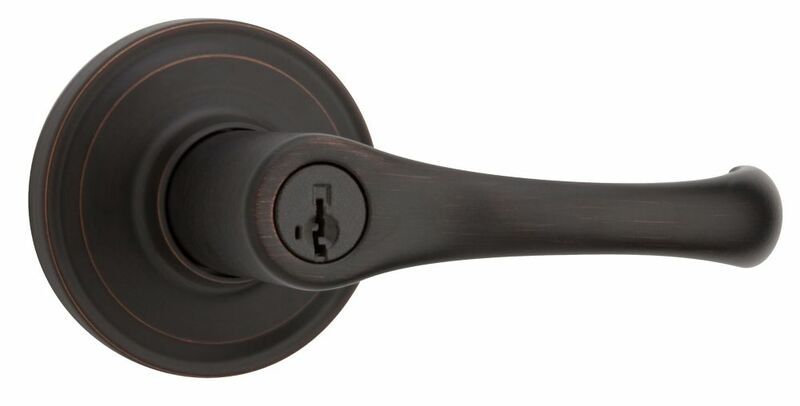 The straight styling of the Aspen lever creates an elegant, contemporary feel Both knobs/levers can be locked or unlocked by key on the outside, or turn button on the inside. The Venetian Bronze finish is hand-rubbed to reveal unique bronze highlights and provides a rich and warm complement to the product's style.